Current version is 5mg1 dated 2016-09-21, latest location databases of 2018-10, see download below. 2013-10-25 — After a longer break, I’ve been very productive the last few days. Many of the smaller work items have been finished. The tracker works more reliable and recognises the most current versions of browsers and systems and has a better search crawler detection. The UI design is refreshed and the visitor log filter a lot easier to use. There are a few fixes and enhancements in the query view, but the long-planned visual designer isn’t there yet. For those interested, there’s the full change log with all the details. 2012-11-26 — Today, the first public version of tòmò is available. See downloads below. It’s merely a public preview at this time. While the tracker code is quite good already, the query interface lacks most of the cool features that allow all the wonderful analyses described here. But since they need lots of data anyway, I thought this order of implementation should be okay. The plans are done and current tracking should be sufficient for them. “tò mò” [tɔ mɔ] is Vietnamese for “curious”. It’s called like that because tòmò is curious about your visitors, and for webmasters who are too. Once I started using Google Analytics as part of a Google AdWords campaign, paid by a voucher. 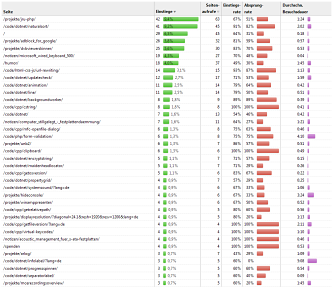 This was my first experience with real web analytics beyond the usual web server access log viewers. Its feature richness was overwhelming and at times confusing, too. Then increasingly data privacy issues became public, and sending all your visitors’ data right to another country somewhere around the world isn’t exactly what you could think of privacy control. This is what Piwik is for: it runs a decentralised service you can easily host yourself. But Piwik is very limited in the questions it will answer you. That’s because it does pre-calculation of certain statistical data and you can only query on that, not on the full actions log. tòmò was created to allow full control over the queries you run, at any time. It works on the raw (well, minimally pre-interpreted) sessions and actions log, which may cause queries to be slower for medium- to higher-traffic sites but at least you get the information you need. Also, tòmò is very compact. It consists of only a small set of files that you can just drop anywhere on your webspace. No database setup required. No third-party cookies, it’s all on the same domain. tòmò also aims at providing an intuitive user interface that won’t leave you lost in data. So how fast is it? As already stated, tòmò is best suited for lower-traffic websites. I have generated some (unrealistic) test data for one year of 50 visits per day and 8 pages per visit on average. My development computer was a Core 2 Duo 1.8 GHz (the smallest model in its family from 2007). 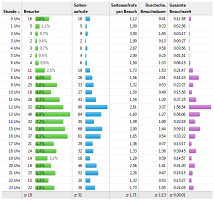 Statistic queries over the entire time span take something between 0.4 and 2.5 seconds, depending on the query complexity. Reducing the statistics time frame to three months by a regular filter makes it very fast again. So for the common use case of analysing parts of your website for a defined time span it should be reasonably fast. 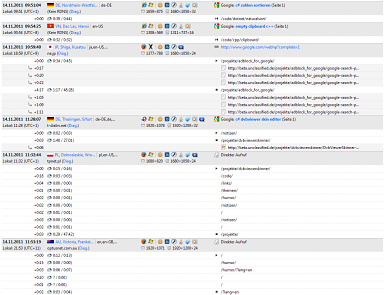 For comparison, my entire software development website currently has 30 visits per day with only 2 pages per visit. The mass data test database was about 16 MiB large. You should expect a bit larger database sizes for a year of 150 000 page requests. (As I said, my generated data is unrealistic and for one doesn’t contain diverse referrer URLs.) My software development site’s database has a size of 6.5 MiB after 15 months. The download includes the mass data generation script that you can configure to do your own benchmarks. The current version is 5mg1 dated 2016-09-21 (commit 6bb15c). Please note that this is an early development version. It has some unfinished parts that may look weird. See also the news entry at the top of the page. tòmò comes in multiple packages. The first one is for users, the second for developers. Please consider using a location database from below. Contains the release code, that is the minified version of all files you need to install and use the application. You will need this one to use it on your website. Unpack all files from the archive in a new directory on your webspace. Everything you need to read and modify the application’s source code and lets you build your own version of tòmò. Does not contain any files that are already in the release package. The latest databases are dated 2018-10. These are the GeoLite databases that are used for more accurate geolocation of your visitors. They include IPv4 and IPv6 coverage, as far as provided by MaxMind. These are optional and you only need either one, i. e. the city database includes all data from the country database. Unpack the file from the archive and save it with the other files in your tòmò directory on the webspace. These files have been converted from the publicly available GeoLite files in CSV format with my custom GeoLite converter application. This means significantly smaller file size for the country-level file and all names stored within the data files. No more code updates when some country restructures their regions. Also, my PHP access code is much shorter, easier to understand and possibly also faster than MaxMind’s. While these downloads should be updated regularly, you can also do the conversion yourself. You should also be able to use MaxMind’s licensed GeoIP data instead. You can find some previous releases in the archive directory. No guarantees for future availability. The full change log contains any changes committed to the code repository. It may be a bit verbose and technical though for non-programmers. See the file doc/readme.txt in the downloaded package for installation instructions. A recent PHP version with SQLite support and a bit of server disk space (for the internal database and supporting data that comes with tòmò) is required for the web server. Apache HTTP Server is recommended but optional. You may need to convert the few .htaccess directives for another web server. Newer SQLite versions are recommended. I’ve observed bad query efficiency with SQLite 3.6 where the same query on the same database was much quicker (with a smarter execution plan) with SQLite 3.7. To make use of the background database cleanup, you need to have access to cron jobs. tòmò itself doesn’t need much disk space. Its components are less than 1 MiB. The GeoLite database files come in two different resolutions. The country-level file is also less than 1 MiB, the city-level file usually has something around 20 MiB. Finally, the visitor log database is also stored in a local database file. This depends greatly on how many visitors your site has and can become several megabytes over the years. During development and tests, I’ve seen a lot more browsers sending plausible data. This includes Safari on Mac OS X, Chromium and Firefox on Linux and Mac OS X, SeaMonkey, and a few other versions of all browsers and of course also newer Windows versions. To view the statistics in all their beauty, you may need to use a current browser. I regularly use a recent Firefox version. You can help adding to this list by contributing a new translation. Please contact me for the details. tòmò is released under the terms of the GNU General Public License (GPL, version 3). A complete version of the licence is included in the download. This product includes GeoLite data created by MaxMind, available from http://maxmind.com/. A complete version of the licence is included in the download. If you have any questions, feel free to ask me (e-mail link). I speak German, English and some French. To all beloved German lawyers, please proceed to my software development website for those damned details.